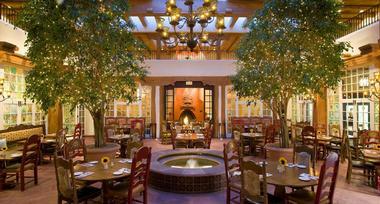 La Fonda on the Plaza is charming New Mexican getaway located in beautiful Santa Fe. The authentic New Mexican décor adds to the historic elegance of the hotel and allows guests to experience old world New Mexico. This hotel boasts 180 rooms and suites, all which feature hand crafted furniture and one of a kind art. 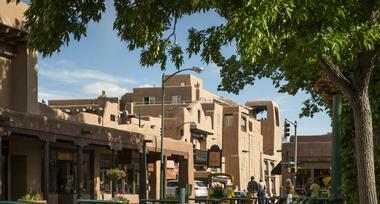 Since La Fonda is located on the Santa Fe Plaza, guests have easy access to shopping, entertainment, local art and other attractions. Within the hotel, guests will find all of the modern day amenities expected of an AAA Four Diamond Award winning hotel. Where to eat is made simple with three dining choices right at the hotel, as well as a bar for guests. Guests can indulge and pamper themselves at the onsite spa or even relax by the side of the year round heated outdoor pool. There is also a fitness room and steam room for guest use. The Southwestern style and old world charm of La Fonda spills over into the guest accommodations, with original art and fine custom furniture decorating each space. Guests staying at La Fonda will enjoy an array of amenities including complimentary Wi-Fi, down-filled pillows and comforters, luxurious bath linens, microwaves upon request, use of robes and even Keurig coffee makers in some rooms. Guests can choose from three room categories: Traditional Guest Rooms, Deluxe Guest Rooms, and Suite Guest Rooms. 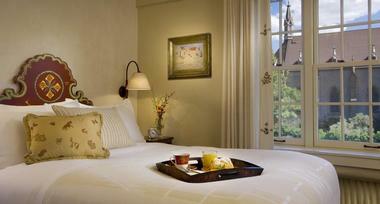 The Traditional Guest Rooms are available with one king or queen size bed or 2 doubles or queens. The room is richly decorated and offers a cozy, hideaway after a day of exploring. The Deluxe Guest Rooms are available with one king or two queen sized beds. These rooms are slightly larger than traditional guest rooms, but still boast the same unique character and elegance. They offer a separate sitting area for added comfort and space. Guests can upgrade their Deluxe Guest Room to include a fireplace or even a private balcony which provides a beautiful view of Santa Fe. The Suite Rooms are one bedroom suites which feature an even larger layout with additional separate space. There is both a separate sitting room with sofa as well as a separate bedroom. From the bedroom guests can open the French doors leading to a private balcony and the luxurious bathroom is also located directly off the bedroom area. For guests looking for a more exclusive, luxurious stay, there is the Terrace at La Fonda. The Terrace offers suites on a private concierge floor. Guests staying on this level have access to their concierge, their own hot tub which is located outdoors on the terrace patio and even a private fitness area separate from the other guests at the hotel. The suites on this floor are offered with either a king size bed or two queen beds. They are laid out much like a studio apartment but with much more elegance and charm than the average apartment. The hand painted headboards are focal point of the well-appointed bedrooms and the roomy living area. Most suites on this floor come equipped with fireplaces for keeping cozy on cool evenings. There are 15 suites in total available on the private concierge Terrace level. 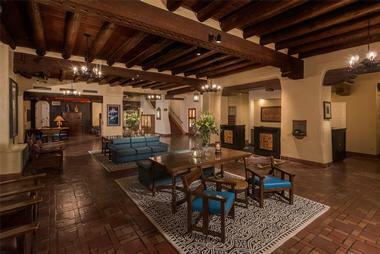 Dining options are abundant for guests choosing to stay at La Fonda on the Plaza. There are three dining options available on site as well as others within an easy distance to the hotel. La Plazuela is an intimate, New Mexican style restaurant which was built on the site of what use to be the hotel patio, built in 1920. They are opened for breakfast, lunch and dinner serving New Mexican inspired dishes with a flare of creativity. The restaurant boasts bright skylights for an open, airy feeling without exposure to the elements. The romantic ambience is only heightened by the sounds of the fountain within the restaurant, the Southwestern style hand painted windows and oversized wrought iron chandelier hanging over much of the restaurant. Guests will enjoy the unique experience of having fresh guacamole made table side or sampling local, fresh selections such as Pan Fried Rainbow Trout. If guests are feeling adventurous, they can order the spicy rubbed Wild Boar Loin for a unique, yet delicious meal. They have a wine list available for pairing the perfect wine with whatever your meal selection may be. Since La Plazuela is open to the general public as well as hotel guests, it is highly recommended to make reservations for dinner. La Fiesta Lounge has recently undergone renovation and updating, offering a casual atmosphere for guests wishing to relax and enjoy an easy going meal or light appetizers. They offer fresh, regional cuisine for lunch and dinner daily. At lunch time there is also a New Mexican buffet available. While there isn’t a breakfast menu served, guests can enjoy the coffee bar which serves up standards such as coffees, teas and juices but also smoothies made fresh to order. The Coffee Bar also offers different gourmet hot drinks like lattes and espresso. Along with the newly renovated space of La Fiesta Lounge, the menu is also updated and new. Guests will enjoy the selection of lighter fare such as Cilantro Lime Avocado Chicken Salad or a good hearty sandwich like the Torta de Borrego--a lamb shoulder with caramelized onion, tomato, avocado, feta cheese, arugula and lemon cilantro aioli on a pretzel bun. The drink selection is vast and very tempting as well. The New Mexican buffet is offered for lunch has both adult and kids pricing. The Bell Tower Bar is set on the 5th level of La Fonda on the Plaza, offering spectacular sunset views. It is open from 11:45 a.m. each day until sunset. This is a perfect dining option for guests who don’t want to indulge in a heavy meal but rather enjoy the scenery of the mountains and sip a cocktail with their delicious bites while sitting in the fresh air. The menu is simple, offering a selection of starters such as tortilla chips and salsa or Caesar salad. Next on the menu are many choices of Quesadillas, from Pulled Pork to Grilled Shrimp and Mexican Cheeses. With each order of a quesadilla, comes a choice of salsa and there is a variety to choose from including a spicy Roasted Jalapeno or sweet Grilled Pineapple. Other Santa Fe restaurants that are popular, should guests wish to dine off-site, are Coyote Café, with a unique, delightful menu for dinner; The Famous Plaza Café—breakfast and brunch are a favorite here, especially for families and it’s located right on the plaza; and for steak lovers there is Rio Chama Steakhouse, also located right off the plaza. Guests can easily enjoy a cocktail, brew or glass of wine in one of the two bar/lounges on site at La Fonda on the Plaza. The Bell Tower Bar is an outdoor, relaxed bar which is open seasonally. The bar menu consists of an extensive margarita menu including The Bell Ringer made with jalapeno juice, jalapeno tequila and triple sec for a fiery Southwestern experience. Beer is available from local, national and international sources and the wine list also includes a local selection. Spirits are available to create crafty cocktails at guests’ request. Guests can enjoy a signature tequila, made especially for La Fonda on the Plaza in the village of Amatitan Jalisco, Mexico. The Bell Tower Bar is open from 11:45 a.m. to sunset when in season. An indoor, year round option is the La Fiesta Lounge. Guests can enjoy live entertainment and the newly renovated dance floor ready for dancing the night away. The drinks menu offers something for everyone, with a broad selection of signature drinks. Guests can choose a Paloma, made with tequila, grapefruit liqueur, grapefruit soda, lime juice and kosher salt, or a Banana Brown Sugar Hand shaken Daiquiri, a sweet choice with Cruzan banana rum and single barrel rum, brown sugar syrup and a splash of fresh lime juice. Along with the signature drink list, the beer, wine and margarita choices are considerable and tasty. The nightlife at La Fiesta Lounge makes it easy for guests to enjoy a night out without leaving the hotel. The Spa at La Fonda on the Plaza is an intimate, relaxing atmosphere with a few treatment rooms. It is tucked away from the hustle and bustle to ensure guests experience the tranquility and peace they would expect from a day spa experience. The treatment menu includes such services as facials, massages, body wraps and more. As a special treat, guests may wish to book a Spa Ritual which could be the “Land of Enchantment”—an aromatic body polish followed by a warm stone massage which will leave your skin feeling smooth and relax your entire body; or the Santa Fe Indulgence ritual—a brown sugar scrub followed up by a delectable chocolate mineral mask and finished with a full body massage. Each ritual consists of approximately two hours of service. Guests wishing to have massage services right in their room can do so, however there is an additional $50 charge. It is highly recommended to reserve any spa treatments ahead of time. The spa is open from 9 a.m. to 9 p.m. daily. Santa Fe has beautiful natural scenery and the golf courses in the area have built around this natural beauty. There are approximately five golf courses within a short driving distance from La Fonda on the Plaza. Because of the higher altitude of Santa Fe, golfers will love the effect on their drive since balls soar through the thinner air at greater distances. Within the area guests will find Marty Sanchez Links de Santa Fe Golf Complex, Santa Fe Country Club, Pueblo de Cochiti Golf Course, and Black Mesa Golf Club. There is not a Kids Club available at La Fonda on the Plaza, however children are welcome at the hotel when accompanied by an adult. There are many family-friendly and kid-friendly activities in the area around the hotel. Activities which may be of interest to families include hiking the trails of Santa Fe, shopping at the surrounding shops and cafes, biking on both paved streets or dirt trails, fishing local lakes for trout and freshwater salmon and so much more. For parents wishing to enjoy an evening out, child care services are available for an additional charge and can be arranged through the front desk staff. At La Fonda on the Plaza, the dedicated wedding planners strive to assist couples to create a truly memorable day. The setting at La Fonda on the Plaza is romantic and elegant—perfect for any wedding. The catering choices available are virtually endless and definitely delectable. Guests at the wedding will not leave hungry or dissatisfied with their meal. Whether couples wish to host an intimate, cozy wedding or an elaborate reception with full dinner and dancing, the staff at La Fonda on the Plaza would be pleased to work on that vision. 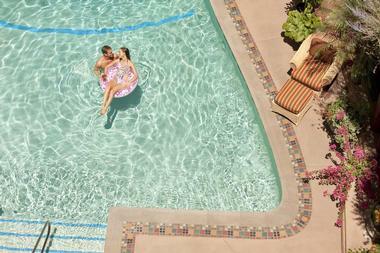 There are four venue choices at the hotel to choose from, each with its own flair and charm. La Terraza Room can accommodate up to 200 guests and features French doors leading out to a patio area as well. This makes for beautiful outdoor ceremonies or additional seating space for guests under a canopy. The large, floor to ceiling windows offer a view of the mountains and the Cathedral Basilica of St. Francis de Assisi. Lumpkins Ballroom has a capacity of 300 guests, but could be divided into two separate spaces for separate functions. There are two fireplaces, which create a comforting ambience for winter weddings. The skylit mezzanine offers guests a gorgeous view of the sky, whether day or night. 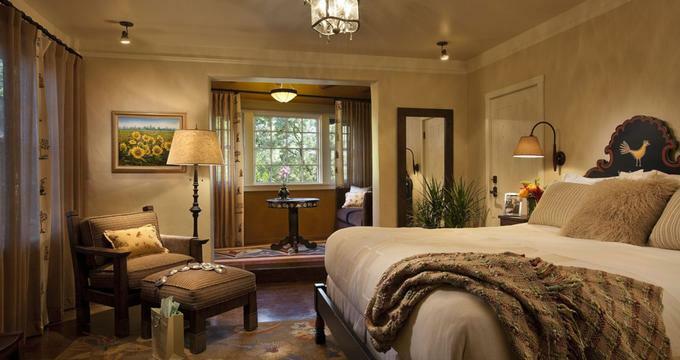 This room features a total of six handmade chandeliers, crafted with New Mexico styling. The New Mexico Room will accommodate up to 100 guests and is adorned by the terracotta fireplace immediately as guests enter. It is a colorful room with hand-carved wood beam ceilings. It is located adjacent to the Santa Fe Room, making it easy to hold a ceremony in the Santa Fe Room but reception in the New Mexico Room. The Santa Fe Room is the perfect choice for couples hosting an intimate wedding. For ceremonies this room will hold up to 150 guests and for receptions up to 50. Meetings and other events are more than welcome at La Fonda on the Plaza. With many venue configurations available, guests will find a perfect fit for whatever it is they have been planning. Along with the rooms available for weddings, there are also smaller, more business-like boardrooms at La Fonda on the Plaza. Conferences, workshops or team building activities are carried out without a hitch at La Fonda. Likewise, smaller events such as reunions, birthdays, anniversaries and more are always welcome at the hotel. La Fonda on the Plaza offers many special features for guests to enjoy and take part in. Shopping is abundant since there are shops located right on-site. From upscale clothing to accessories to kitchen gadgets, the shops located at La Fonda have something for everyone. When shopping gets tiring, guests can stop and rest at one of the many cafes also on site. Some of the food vendors include, irresistible French pastries, handmade chocolates, and so much more. The gift gallery, Detours at La Fonda, offers guests a wonderful selection of locally made art pieces, books and handmade gifts. Detours also offers convenience items such as snacks, drinks, newspapers and sundries. They also have a small selection of wines and liquors. If visitors wish to bring along their furry friend, there are some dog friendly rooms available at La Fonda on the Plaza. Dogs up to 40 pounds are welcome to stay along with their owners for an additional $25 per night and as long as dog policies are followed.